You might not want to think about it, but there’s no avoiding the date: April 15 is quickly approaching. Filing taxes is a huge but necessary chore, and if you’re not careful, it can also be an expensive one. Every year, millions of people make silly mistakes on their taxes that cost them money or delays how quickly they get their refund. This year, make sure you’re not one of them. When I went from being an employee to owning my own freelance business, I made a mistake by not having my husband immediately change his withholding status. That led to an unexpected (and large) surprise when we started filling out our 1040s and realized how much we needed to pay Uncle Sam. Before dropping your 1040 in the mailbox or filing electronically, take the time to double-check your return for these common errors to make sure you’re not losing out on any cash. It may sound fairly obvious, but simple addition errors can and do happen as people work on their tax forms. In fact, these mistakes are quite common — in 2012, the IRS reported that it found 2.7 million math errors on 2011 tax returns. Use a calculator to add everything up, and then do it again to make sure you get the same number. If you’re using computer software to file your return, it will do the math for you, but double-check to make sure you entered the correct numbers — you don’t want to accidentally enter $3,000 instead of $30,000! The IRS does double-check your math, but a mistake could cut into your refund or mean you may need to pay more in taxes. Most tax returns are processed within three weeks, but a math error could mean your return takes longer to process — delaying your refund. It’s much simpler to take the standard tax deduction, but that may not be a smart financial decision. Under current rules, the standard deduction for a single person (or married person filing separately) is $6,100 and for married couples, it’s $12,200. Could you have more deductions than those numbers? It’s a bit of a pain, but the only way to find out for sure which choice is right for you is to figure out your taxes both ways. Add up all your deductible expenses to see whether they’re more than the standard deduction. Common deductible expenses include mortgage interest, real estate or property taxes, charitable gifts and unreimbursed business or medical expenses. The IRS offers this tool to help you decide which option will save you the most money. Did you know there are five different filing statuses? From “head of household” to “married, but filing separately,” each one means something different. If you chose the wrong filing status, you can lose out on money that’s rightfully yours. Read over the different statuses and decide which one fits best for your personal tax situation. If you’re unsure, figure out the taxes two different ways and see which one gives you the better outcome, or speak with an accountant. You know how much money you made last year, right? Well, if you have a side business or picked up a few freelance gigs, make sure to include that income as well. Make sure to report all you income earned during the previous year. Since businesses are sending their W-9s to the government, too, the IRS will see those payments on corporate business returns. If you fail to report some income, the IRS can come after you and make you pay additional taxes in addition to a penalty. You have your receipts from your church and charities that you sent checks to, but what about the huge box of clothing you donated to Goodwill? Always ask for receipts and keep track of all donations during the year if you plan to itemize your taxes. Remember to get a receipt for donated goods and services as well as cash, since these also count as deductible expenses. Many people wind up paying higher taxes or receive a lower refund because they didn’t fully account for all of their charitable acts. This is the mistake my husband and I made. While it may seem like good news that you’re getting big refund, it may also be a sign that your withholding status isn’t correct. Your status is basically how much money your employer takes out of your paycheck for taxes and sent on to the IRS. In other words, a part of each paycheck goes to the government to pay your annual income tax. If you don’t take out enough, you can wind up paying on April 15. If you pay too much, the government will send you a refund. Done right, everything should be evened out come April 15. Whenever you start with a new employer, the HR folks hand over a worksheet where you put in your Social Security number and answer a few questions (such as how many dependents you may have) to help select a withholding status. Unsure of what’s right for you? Ask someone in HR or go online to learn about different witholding statuses. No one likes doing taxes, but some simple double-checking can make sure you’re paying your fair share (and not more) come April 15. 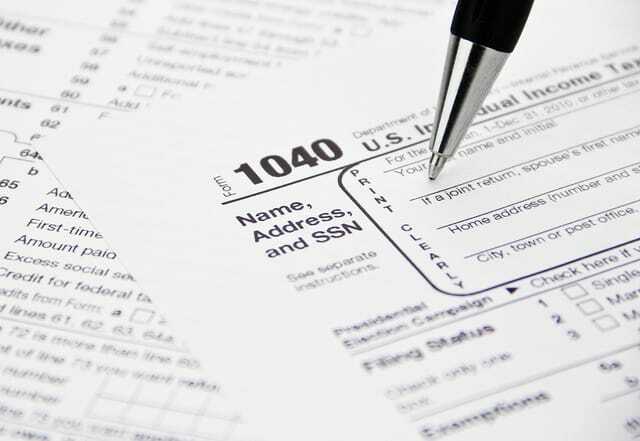 Your Turn: Have you ever made one of these mistakes on your taxes? MaryBeth Matzek is a mother of two and a Wisconsin-based freelance writer. When not spending time with her family or writing, she’s out trying to find the best possible deal.